Patrick Munnings (right) and Dominic Grose paddling hard, without a pony in sight! Dominic Grose has been selected for Tasmania’s Junior Team at the National Canoe Polo Championships held over Easter. NESTLED IN the hills behind Lilydale is a picturesque and peaceful farm dam. Peaceful, that is, except when the ducks and platypus give way to a small group of dedicated and enthusiastic people busy training for the National Canoe Polo Championships in Penrith NSW, where they will represent Tasmania over Easter. “It’s been twenty years since Tasmania last sent a team to the Nationals,” says team manager Jenny Purtell as she watches what appears to be the chaos of a dozen or so kayaks bumping and bashing as their occupants attempt to toss a ball into a goal set 2 metres above the water, or wrestle the ball from the opposing team. Sending 17 athletes and kayaking gear interstate is proving to be a challenge but the teams feel it will definitely be worth the trouble and are busy fund-raising to purchase new, competition-standard gear. With financial support from Tamar Canoe Club and local businesses, the group are also receiving help from an unexpected quarter. “We are so lucky to have the support of Australian canoe polo team member Jade Kerber,” says Dominic. Jade has volunteered his time to give extra coaching in the month prior to the competition. “Jade’s dedication and generosity sets a great example for our junior players as they start their journey towards high level sport,” Jenny adds. 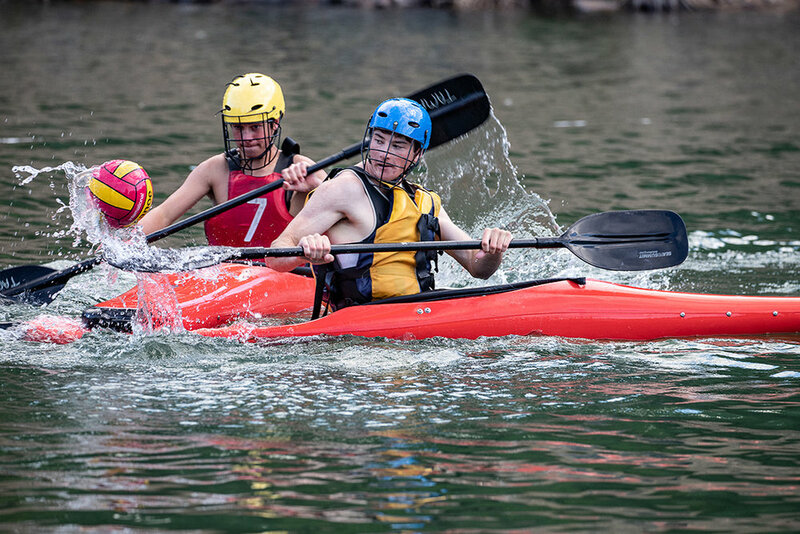 “The forming of the team has had many more benefits than purely physical gains – it has built friendships, a sense of camaraderie, developed team work and built self-confidence within its members.” Canoe polo is a relatively low-profile sport, particularly in Tasmania. While not anticipating great success this year, Jenny hopes that the experience will stand the teams in good stead for the future competitions and boost interest in the sport. Geo Harvey riding Tanbark Redpa of Westbury competing in the Roy Davies Memorial Stockman’s Whip Crack at the Harveydale gathering of the Mountain Cattlemen’s Association. The competition involves hitting 10 targets with your whip in a horse shoe design. Pictured below: Ruby Geach 12yrs with brother Lenny 6yrs compete in the junior whip cracking. WESTBURY GOT a country jolt in February with horses and stock whips gathering for some fierce competition. The annual Mountain Cattlemen’s event landed at Harveydale this year with hundreds of people coming to compete and watch. Longford man Will Browning took home the Senior Championship, Victorian man Peter Hodgkin took second, while Sassafras local Ben Howe took third place. In the junior division, first, second and third were Westbury girls, Maya Scott, Georgia Burford-Rowe and Georgia Elias. TMCA Secretary Danza Hardwicke shared how gate takings were on par with previous years. “There were a lot more day passes sold this year with the event being close to a town. We even had a couple of mainland competitors. “We have a championship of four stages, whip crack, handy stockhorse, cattle handling and an optimum time stock horse race. The competition was high, so it was a good event. “This year we trialled an U12 event which got 14 children involved. 2019 was the 32nd meet which moves around the state each year. The association, from their website, states that they actively try to pass down traditional stockman’s skills and are trying to protect high country heritage and traditions. DELORAINE FOOTBALL Club is celebrating its 125th year in 2019. The first function for the year is bound to start the celebrations o§ on the right foot with a Comedy Road Show to get everyone laughing. The Laughs of Launnie International Comedy Festival will be held at the Deloraine Football Club, Racecourse Drive Deloraine on 22nd March at 8:00pm. The line up includes Lindsay Webb, Bryan O’Gorman from Canada, Kirk Smith representing the US of A, Luke Heggie, Fiona O’Loughlin and more. Tickets are $50.00. The show is for one night only so book early by calling 0437 749 034 or email hannah-kate05@hotmail.com Organisers think life is better when you’re laughing and invite you to come and laugh with them. The Carrick Park Pacing Club’s major event of the season, the Carrick Cup, takes place on Saturday 16th February at twilight. For the first time a sale of yearlings will be held. It is the only sale of standard bred yearlings in Tasmania this year. Other attractions during the evening will include: the Vandenberg Transport Carrick Cup, Fashions on the Field competitions, a double-seated sulky race, celebrity pony race, live music, free children’s jumping castle & face painting, and a Polocrosse demonstration. Tasmanian Polocrosse players from the Midland Spurs and Kentish (green & gold) are pictured above during the polocrosse demonstration match at last years Carrick Cup. Jak Oxford and Tom Stylianou on the mountain biking circuit. THERE ARE A couple of Mountain Biking pros riding around Meander Valley, having just shown Australia how good they are. 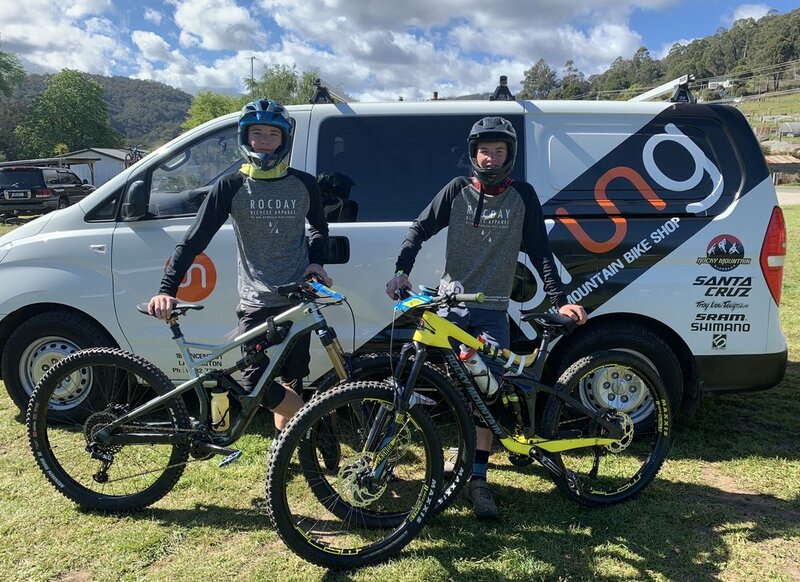 Cycling brothers Jak Oxford and Tom Stylianou recently competed in the Australian Shimano Enduro Tour which spanned across Queensland, Tasmania and Victoria, with Jak winning the series overall in their division (1180 points) and Tom coming third (920 points). CHRISTMAS IS a time to be happy, to marvel at the colours that fill the stores and gild the decorated trees. Around the end of November, the Christmas-themed treats seem to come out and the supermarkets start stocking shelves with colourful and yummy looking chocolates and candy canes. I celebrate the festive season by getting a Beer Advent Calendar, my ‘treating myself’ is in full swing even before Christmas Day when the coup de grace of eating and drinking time comes. By the time Christmas and New Year are over, I’ve gained weight and I haven’t been active for weeks. Fortunately, there are tips and tricks to turn to, so as to not completely wreck yourself over the festive season. After speaking to two local health enthusiasts, I discovered a few things to keep in mind leading up to and following the holiday season. Westbury based Personal Trainer, Liza deLautour, who runs You & Me PT, believes that where everyone goes wrong is with all the food on Christmas Day. “Part of the problem with Christmas is all of the leftover food, it tends to last for days,” she said. “We have become a nation of people who like to socialise over food and drinking alcohol. We need to move more and find other ways to socialise. “I would suggest that people move, move as much as they can. We tend to be sitting, eating and socialising a lot around this time of the year. “Put on some music and dance, drink lots of water, its finding that balance. Deloraine-based Personal Trainer, Kimberlee Dixon believes that people need to have more self-control when it comes to the big day and an ongoing commitment to what you eat and do. 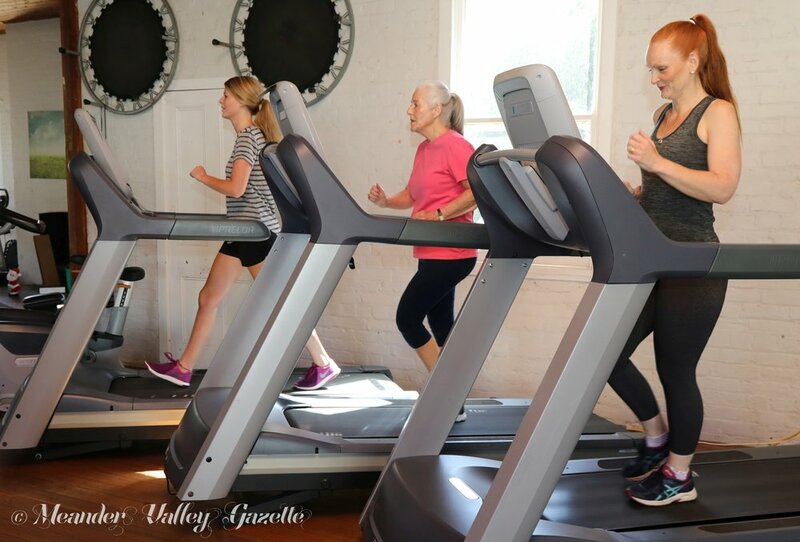 “I tell my clients that they have to do dieting and exercising,” she said. “A lot of people often think they only need to do one or the other. Unfortunately, you have to do both to get the best results. “Eating bigger breakfasts, medium lunch and a smaller dinner is the key. We need to fuel our bodies for the day, and by the end of it we go to bed with less in our stomachs. “Many of us end up eating a lot at Christmas, but we are all human at the end of the day. “If you want to stay in shape you need to try and resist large portions. Give time for your body to process, go for a nice walk or play some cricket in between, said Kimberlee. It’s up to us to be good to our bodies, still enjoy the holidays but rethink our eating habits and be social in ways that are more active. I still over ate this Christmas, but now I have some tools that will help to improve my overall health and wellbeing. Of course, if I need some professional help, Liza and Kimberlee are out there and happy to help us reach our goals. Thank you to ‘You & Me PT’ and ‘Kimberlee Dixon Personal Training’ for taking the time to help with this story. (L to R), Emily & Phyllis shape up after Christmas with Tamsyn Stock-Stafford of Body & Soul Wellness Studio in Deloraine. Skater Peter Ashton promoting his lifelong Sport of ‘Inline Hockey’. PETER ASHTON IS keen to introduce the sport of Inline Hockey to the Meander Valley – an activity he has enjoyed for over 50 years, including 20 years as an Ice Hockey player. According to Wikipedia, ‘Inline skating is a multi-disciplinary sport that refers to a number of activities practiced using Inline skates. The skates typically have two to five polyurethane wheels, arranged in a single line by a metal or plastic frame on the underside of a boot. The in-line design allows for greater speed and maneu - verability than traditional (or “quad”) roller skates.’ Following a recent risk management review by Meander Valley Council, it was found that Peter’s old Friday evening skating sessions at Deloraine could no longer be held until new arrangements were made. With suitable insurance now sourced, skating activities will re-commence in Deloraine at the MVPAC Stadium and at Westbury Sports Centre. Meander Valley Skating Club will hold its inaugural meeting at the Meander Valley Performing Arts Centre Stadium in Deloraine on Friday 8th February, 2019, from 6.00pm to 7.30pm. The formation of an unincorporated club will be proposed at the meeting and prospective Inline Hockey players, aged 6 to adult, can also attend to express their interest. For all inquiries, including registering interest in joining the Club and to receive a copy of the meeting agenda, proposed Constitution and proposed club rules, contact Peter Ashton on 0409 234 061 or by email at patasaust@gmail.com. sled, the aim is to reach 100 metres but often tractors spin out or lose power, so every centimetre counts when it comes to bragging rights. Money raised at the event goes back to Apex Club of Deloraine and gets distributed around the Meander Valley community during the year and to groups such as Give Me Five For Kids. SHOWJUMPING IS a great spectator sport with lots of action-packed riding! The Meander Valley Council Jumping Tasmania State Titles 2018 are being held at the Westbury Showgrounds on Saturday 15th and Sunday 16th of December. The event is run by Jumping Tasmania North and there will be two rings and classes of show jumping consisting of riders of various ages and ability levels. successfully then go into a third round which is a jump off against the clock. The other type of class is a Speed class. Riders in these classes aim to complete the course in the quickest time without having any poles down or refusals. There is a Trade Expo where local businesses will display their products; food and coffee vans will also be on site. Jumping Tasmania North is very fortunate to have many local businesses and services sponsoring and supporting the event. Spectators are welcome and encouraged. Entry is free of charge! LOCAL CRICKET is alive and well this summer with a charity event held in November to raise funds for the Ponting Foundation. Bracknell Cricket Club Men’s A Grade played a game against the Bishopsbourne Panthers. The score was Bracknell 138 and Bishopsbourne 7-139. Bishopsbourne was bolstered by fill-in team mate Tom Triffitt, former Australia U/19, Tasmanian and West Australian Keeper. Along with the match there was a BBQ, activities for kids, an aftermatch function followed by a silent auction, monies raised went to the Ponting Foundation. Tom was a guest speaker for the event. Bishopsbourne Co-Coach Hamish Jones one of the organisers, was pleased with the amount raised. “We plan to do this kind of event every year, it is a really good cause to get behind,” he said. At the time of writing this story, the final total raised at the event wasn’t yet declared. From their website, the Ponting Foundation is dedicated to helping young Australians and their families beat cancer. It provides funding for a range of services. IT HAS been an exciting start to the season for Deloraine Little Athletics with the arrival of a new High Jump mat. Initially the cost of the mat was going to force the club to borrow a mat, but with a successful grant application from Coles (one of Little Athletics major sponsors) and a helping hand from a local freight company Highland Haulage, the club was able to afford a new mat. “Our athletes were very excited when it arrived, and there were two state qualifiers on the first day of using it!,” said Club President Gina Sullivan. “We cannot thank Highland Haulage enough for their assistance in freighting it down from QLD. It was going to cost our club $3,500 to ship it to Tasmania, so their assistance was greatly appreciated in helping our local centre. “Having this mat means safer jumping for our athletes and when they go to compete at State Events they are familiar with using this type of mat,” said Gina. The season continues through to March 2019 so we hope to see more qualifiers and maybe even some records! CARRICK RACE Course is proud to be celebrating 170 years of racing this season. Originally developed on land reserved by the late Sir Thomas Reibey, the original course was located about three and a half kilometres east of Carrick. Finding conditions far too wet in the winter, the Carrick Racing Club soon decided to purchase and develop the present site of the course. Carrick Racing Club was set up in 1848, holding their first meeting on Boxing Day 1849. The club folded in 1912 with the assets purchased by the Carrick Hack & Trotting Club. Both forms of racing were conducted for a number of years. When the number of gallopers declined, the club changed once more and became the Carrick Trotting Club. The Carrick and Westbury Trotting Clubs combined in 1976 to form the Carrick Park Trotting Club, later renamed the Carrick Park Pacing Club. Over the years, Carrick has been, and remains, the only race course in Tasmania entirely controlled and owned by the club. To celebrate this milestone, the club will once again stage three race meetings. The first was held on 2nd December. The Meander Valley Cup will be run on 30th December and the Carrick Cup will be run on Saturday, 16th February. At just 16 years old, Westbury young gun Tate Frost is holding his own on the national circuit. I’M SURE most readers will know what a go-kart is and there are probably a few who would be able to describe what a sprintcar looks like. But I wonder how many would know that Westbury is home to possibly one of the brightest go-kart and sprintcar talents the country has ever seen? With around 300 starts under his belt and some 60 odd trophies on the shelf, Tate Frost has had podium finishes against some of the best karters in the nation, if not the world, and is fast becoming the next car racing sensation in Australia. And he is just 16 years of age. With a pedigree of car racers in his blood (his father Anthony and grandfather David were both racers in their own right), Tate is on track to surpass his forefathers’ successes and become one of the best this country has seen. Tate started go-karting when he was 9 years old and had his first competition win a year later at Smithton. He now races throughout Tasmania and is a frequent competitor on many of the mainland tracks. Already he has picked up three Tasmanian Championship title wins and in 2016 Tate was awarded the “Tasmanian Karter of the Year” trophy after an outstanding season winning 24 races from 24 starts in his class. In August of this year, Tate competed in the 5th Round of the Australian Championship in Victoria and, after being placed in two heats, eventually finished 5th in a field of 36 in the Final. It should be noted that this field contained both national and overseas competitors including past champions. Just last year, Tate started to race in sprintcar events and has already managed a podium finish in Hobart. The team is quietly confident the new season will bring Tate his first sprintcar win. Apart from exceptional skill and talent, Tate’s success is in no small way due to the dedication of his racing team and especially the determined and resolute support from his family. When asked about his plans for the immediate future, Tate says he’ll be looking to become a mechanic when he leaves school at St Patrick’s College in Launceston. And, with such a dedicated team at his side and such solid family backing, there is no reason to believe he won’t achieve his ultimate goal to compete on the NASCAR circuit. Further information on go-karting and sprintcar racing can be found on Facebook at AFR Anthony Frost Racing. You will also be able to keep up-to-date with Tate’s progress and see pictures of the new transporter. Tiffany Barnett of Prima Spada in a renaissance-style fencing bout. THE ART of swordplay is not some antiquated activity from old history books or restricted to Olympic fencers dressed in white, fighting desperately for a point. In recent years, historic fencing clubs, re-enactment groups, and historic competition leagues have sprung up worldwide. Fencing master Keith Beattie founded Prima Spada School of Fence in June 1995, as an historic fencing school, firstly in Queensland. Keith has now set up in Deloraine, where he hopes to capture the imagination and passion of local sword enthusiasts and wouldbe musketeers. Prima Spada tuition is available to students from 14 years to mature, beginners to advanced. Keith promotes the study of fencing by offering a variety of options including Historic European Swordplay and Modern (non-electric) Recreational Fencing. Tuition includes combinations such as Rapier and Companion Weapons, Side Sword, Sword and Buckler, French Small Sword and Two-Hand Sword. Modern fencing tuition in Foil, Epee and Sabre (recreational fencing) is also offered. Prima Spada is unique in variety and expertise. Students learn specialised swordplay for the experience of modern sport from an ancient art. Lessons are supervised and controlled in a safe and professional environment using Australian Sports Coaching principles. Qualified instructors are accredited by the Australian Academy of Fencing. Prima Spada classes are held Monday evenings at Deloraine Performing Arts Hall. Call Keith Beattie on 0407 642 937, enquiries@ primaspada.com.au. Bracknell Seniors made the ﬁnals this year and played South Launceston at Windsor Park. In the ﬁrst quarter Bracknell stormed onto the ﬁeld and were all over the opposition like a cheap suit. The play was fast and aggressive not giving Launceston time to settle. South Launceston must have received a severe pep talk because the second quarter saw them come out ﬁring on all cylinders and soon wiped out Bracknell’s lead and went on to establish a comfortable lead by the end of the quarter and were never headed. Deloraine Junior Football Club U14’s DIV 2 team won their ﬁrst Grand Final in 27 years in the NTJFA. Beating the East Coast Giants by 13 points at UTAS Stadium, the final score was 9.2.56 to 6.7.43. The game started slowly and by three quarter time the Giants were 11 points up. The Kangaroos held on in the fourth and kicked four majors, keeping the Giants scoreless to win the Premiership. The Kangaroos had an amazing season, finishing clear on top of the ladder with 13 out of 15 wins and a whopping 1420 scored in the season with 302 scored against them. Many games were won by more than 100 points. Ryan Drake was awarded best on ground. The ‘Women in waders’ initiative of the Quamby Fly Fishers Club attracted a crowd of women keen to try their hand at the somewhat genteel sport. Approximately 40 learners and tutors gathered on the banks of the picturesque Huntsman Lake at Meander, rugged up and ready to brave the chilly winter weather. Attendees were split into small groups and given individual attention by tutors who coached them in the basics of casting. The equipment needed was provided by the club. Previously regarded as an all male pursuit, women are now making a determined attempt to redress the gender imbalance. MEANDER VALLEY teenager Sahara Rumble has been riding horses since she could walk. Now, at age 13, she will be able to show her skills at a national level. The National Equestrian Interschools Championships take place every year in a different state of Australia. This year, they are being held in October at the National Equestrian Centre in Werribee, Victoria. Over five hundred riders will be competing in a number of disciplines including eventing, show jumping, dressage and show horse. 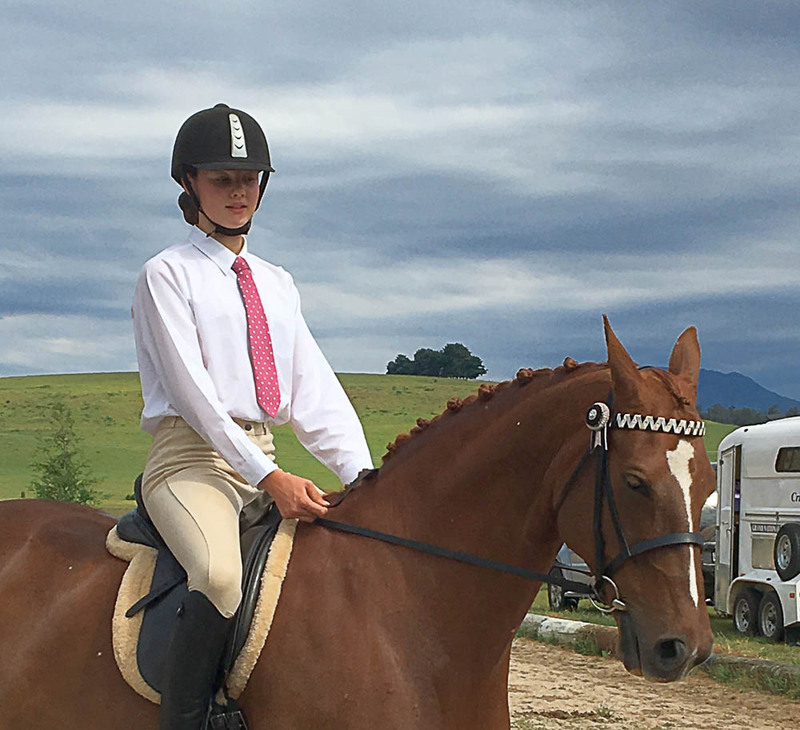 Travelling with other Tasmanian riders and trainers, Sahara will be competing in the dressage on her warmblood mare, Repertoire, who was born on their farm near Deloraine. In the leadup to the event, Sahara has had to put a lot of work into her routine and, most importantly, her horse. Sahara would like to thank the Meander Valley Council, Deloraine and Districts Community Bank and members of the Meander Valley community for their financial support, Deloraine District Pony Club, her coach Amanda Cameron and her family for their support. THE HUGE rift between some Meander Valley councillors and Deloraine’s sporting leaders shows councillors must take a serious look at how well they communicate with their communities. For four years Deloraine sports clubs have worked on a proposal to consolidate the town’s sports facilities, revving up over the past year to gain $98,000 from three bodies for a feasibility study. Meander Valley Council was one of the funding contributors, even using its staff to apply for a State Government grant. Mayor Craig Perkins posed for newspaper photos with the sports club leaders, councillors said the study should be put out for consultation to all community groups. And then at the August council meeting they tried to dud the project. It’s easy to understand nervousness around the costs of such a project, especially after councillors’ reluctance to increase rates by five per cent. But even after doing the rounds of the budget allocations, they still had to increase rates by almost 4.5 per cent, and some nice projects were lost in that little axing. Sometimes, as Launceston City Council has found, you have to up the rates to provide what people want, even if it costs you more to bury grandma. The Deloraine recreation project was going along swimmingly, without expectations by the sports clubs that new facilities would be instantaneous. They knew the changes would be incremental over time, but at least there would be a long-term plan. For some reason some councillors got cold feet. That’s in stark contrast to the recent Westbury recreation situation where, similar to Deloraine, a community had dragged on for decades with non-existent council responses to its calls for better football and cricket change-rooms. And this year what did councillors come up with? A two-storey ‘recreation’ centre with change-rooms and a gym on the lower floor and a 200-person function centre with state-of-the art kitchens on top. It took a public meeting full of outraged and derisive Westbury people for the council to back down. Westbury people didn’t want that; they wanted a village atmosphere for their town. Deloraine wants better sports facilities. Why? A prominent business owner told me this: “I know Deloraine families who have moved to Launceston so their kids can play sport. I also know families who drive to Launceston three times a week so their kids can play sport. At the August council meeting Cllr Bob Richardson said Deloraine shouldn’t have better recreation facilities because Hadspen and Bracknell are more deserving. Hadspen is a town the same size as Deloraine but it needs an identity, he said. Bracknell is more deserving because its sewage flows down the main street, he said. But last time I looked I didn’t see Hadspen and Bracknell people applying for feasibility study funding, putting pressure on politicians, having public consultation sessions and doing the hard yards to get a plan together. Deloraine sports teams did. And Meander Valley Council tried to dud them. Go figure.